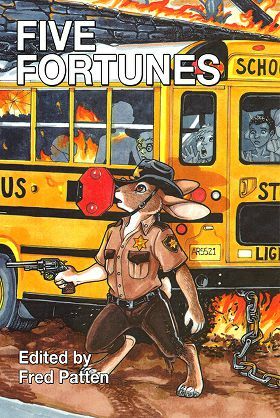 You can get Five Fortunes for $19.95 at the FurPlanet Productions table at Further Confusion 2014, January 16-20, in San Jose, California, or order it from the FurPlanet online store upon their return. Thanks again, Fred! It's been an honor to work with you! Sounds wonderful. Is it a soft-cover book? Oops, I forgot to mention this. Yes, it's a trade paperback. What is the story of this cover illustration? - Sheriff Bunny: It's on fire! Shoot it! - Kids: Oh, hey. Looks like we're on fire again. This is mildly surprising and/or distasteful. - Sheriff Bunny: You might ask why there's no smoke from the hellish blazing flames, why is the bus dragging a giant clanking chain, and why am I staring at the sky while my nose does a tangent with the stop sign. The answer is I don't know, but maybe I can shoot it better? It's a scene from Phil Geusz's "Chosen People". I think that Terrie Smith's only artistic liberty was to not show the scene as full of smoke and more fire, distorting heat waves, and falling ash -- they're described in the story -- or you couldn't see much else. What he's going to shoot in the fire, why there's a giant clanking chain, and why he is staring up are answered in the story. I can always use more reviewers of my books. Alas, you cannot, because UPS did not deliver it on Friday, and it was not marked for Saturday delivery. So, they did not make it to FC after all. Oh, poo! Sorry. 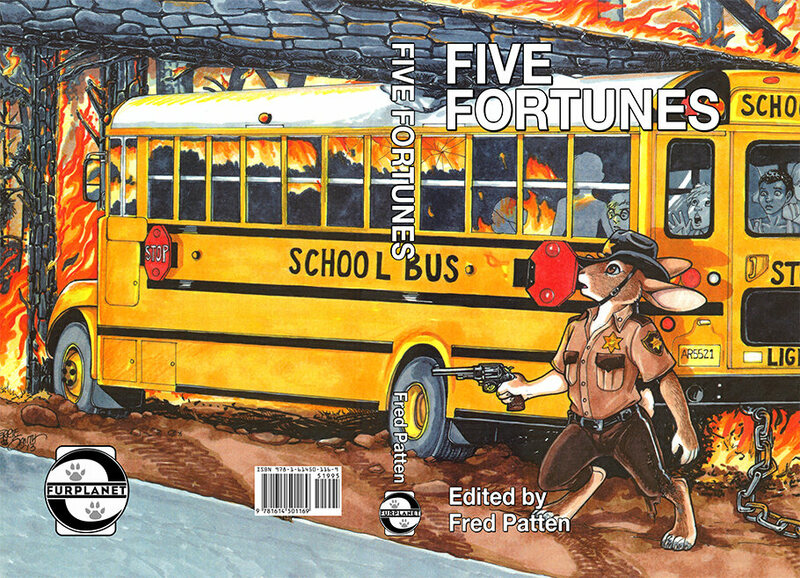 I guess that those who want "Five Fortunes" will have to order it through FurPlanet's online catalogue. I think that the next convention that they will have a table at is Furry Fiesta in Dallas in February. Good thing I live in Dallas!